Seriously? OMG! WTF?The Osbournes Archives - Seriously? OMG! WTF? 2019 is not Ozzy Osbourne’s year. Back in October, he postponed several tour dates due to an infection in his hand that required surgery. Then in January, he had to postpone even more tour dates because he developed pneumonia. Today, he announced that he is just going to postpone all the dates for this year. OZZY will postpone all his 2019 tour dates, inclusive of shows in North America and Europe, as he recovers from an injury sustained while dealing with his recent bout of pneumonia. The Rock and Roll Hall of Fame inductee and Grammy®-winning singer and songwriter and 2019 Grammy® Special Merit Award recipient fell at his Los Angeles home aggravating years-old injuries (from his 2003 ATV accident) that required surgery last month. OSBOURNE will remain under doctor’s care in Los Angeles as he recovers. According to CBS News during that 2003 accident, “he had a fractured left collarbone, he had some damage to the blood vessel that is underneath it, he had eight fractured ribs on the left side and, in addition to that, an entirely stable fracture to one of the vertebrae in his neck.” No word which old injury was aggravated by the fall. Also, I don’t know what was in that bat’s blood, but it seems to have made him immortal. On January 24th, Ozzy Osbourne coughed so hard, he blew a blood vessel in his eye. Then five days later, he postponed his tour due to doctors orders because he is suffering from a severe upper respiratory infection. Today, his wife, Sharon Osbourne revealed he has been hospitalized. Hopefully, the 70-year-old singer will be better soon and bats will be fearing him once again. Ozzy Osbourne was supposed to start his European tour today, but his doctors forced him to cancel it. The singer has a severe upper respiratory infection and doctors feel if he went on tour it might develop into pneumonia. Therefore, until he is given the all clear, he is stuck at home recovering. If it were up to him, he would go on the road. He had a message for his fans, “I’m completely devastated for having to postpone the European leg of my tour. It just seems that since October everything I touch has turned to sh!t. Hopefully, when he tries to hit the road again, he will have the Midas touch and not the sh!tty one. Ozzy Osbourne created a must-have stuffed animal! 37 years ago, Ozzy Osbourne took the stage in front of a bunch of music execs and gave them the shock of a lifetime. That shock was biting the head off of a bat. The rest is what urban legends are made of. That urban legend is coming to life with a $40 plush bat which comes with a detachable head. The perfect gift for any Black Sabbath fan or the warped aunt or uncle in your life. The latter will give it to their favorite young nieces and nephews just to see their reaction when the head comes off and then run away as their parents have to deal with the aftermath. 落 I already ordered one for all the kids in my life! 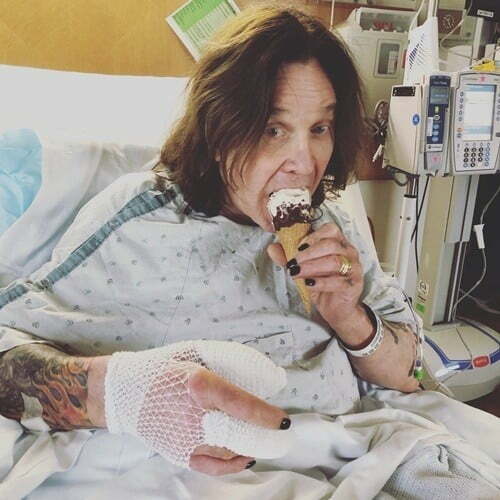 Ozzy Osbourne spent this week in the hospital for hand infections that has caused him to get surgery for them. The health emergency happened just as he was about to go on tour, so he postponed those dates for later in the month. Now those shows are being rescheduled for next year. Hopefully, the next surgery will be his last one and he will be back to old Prince of Darkness self.